Hundreds of people showed up to a candlelight vigil in Valleyview Tuesday night to remember one of the Alberta victims of the Las Vegas shooting. The small town of Valleyview, Alta. 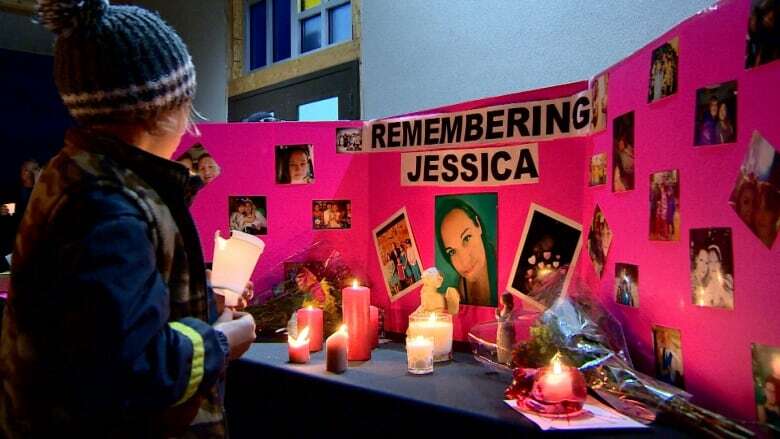 came together Tuesday night to pay tribute to Jessica Klymchuk. Hundreds lit candles and comforted each other as they remembered the 34-year-old mother of four and educational assistant who was killed in Sunday's Las Vegas mass shooting. "I'm really sad. 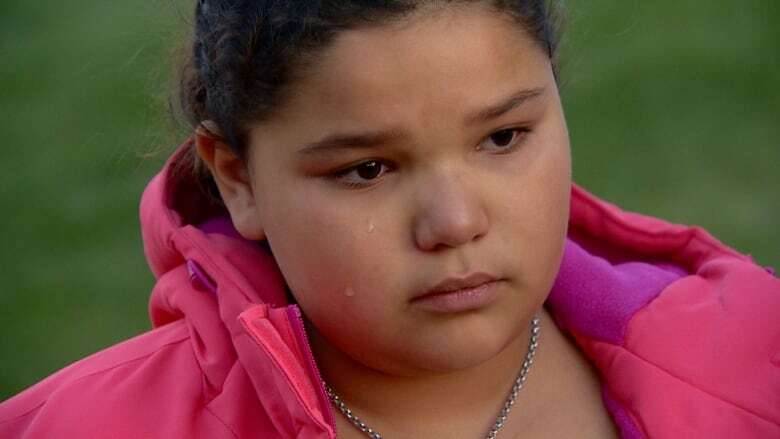 Jessica, she was like the kindest person I knew," said 11-year-old Mikayla Paquette. Tears streamed down the face of the Grade 6 student as she explained it was important for her to be at the vigil because of the love Klymchuk showed to her and other kids. "She was kind and sweet — the most awesome teacher that I knew," she said. Mikayla held her candle up alongside her friend Nahdia Balabuck who is also trying to come to grips with the devastating loss. 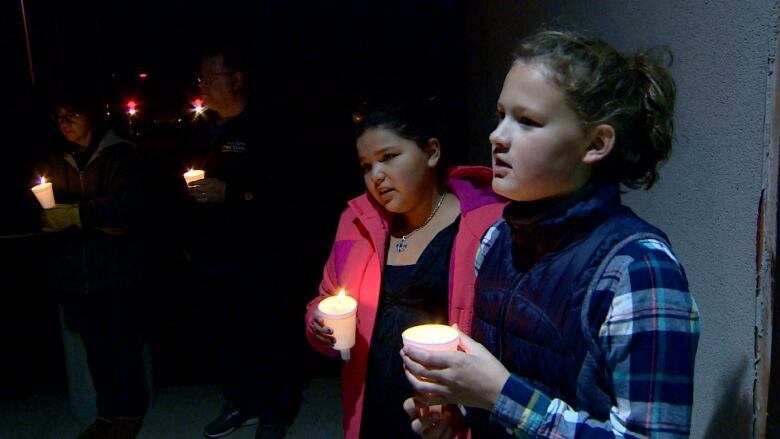 "I just really, really miss her," said the 10-year-old at the vigil, held at St. Rita's Catholic Church, just across the street from St. Stephen's Catholic School where Klymchuk worked. "She was our bus driver, an aide in the class and our librarian," she said. Nahdia said she'll always remember the bus ride to school because whenever Klymchuk was behind the wheel she would tell jokes and make the kids laugh. There were also many friends there to honour Klymchuk and share stories. "She had this heart of gold," said Christine Ikonikov, a friend of Klymchuk for the past 10 years. "Wonderful woman, strong, always put other people first." Ikonikov felt compelled to organize the vigil in her friend's memory. "We just want to all come together and support each other and give the family and close friends strength at this time," she said. There were a few minutes of silence as people lit candles but the quiet was impossible for some who were crying. Many people shared hugs as some were seeing each other for the first time since hearing the news. 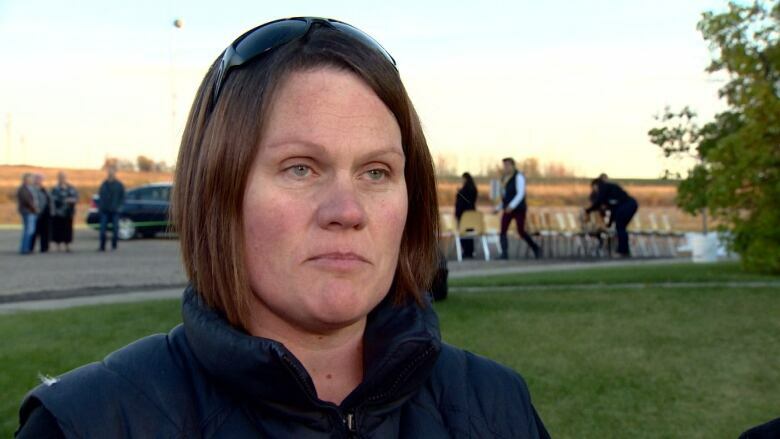 A message of thanks from Klymchuk's family was read out to the people of Valleyview. Following the vigil, people spent time looking at a display of photos of Klymchuk, as well as pictures of her son and three daughters. Some of her favourite country music tunes played on the speaker. It was a love of country music that took Klymchuk and her fiancé to Las Vegas in the first place to be at the music festival where the deadly shooting happened. Nobody spoke of the violence in Las Vegas other than to say how senseless it was, instead preferring to remember the difference Klymchuk made in so many people's lives. Nahdia said she had once been given an award by Klymchuk and her memory will live on in the school and its students. "She really did help us a lot." Gareth Hampshire is an award-winning journalist who has been covering Edmonton for CBC News since 1998.